The selection of a young woman to represent the Odawa people has been happening in some form since the 1930s. In conjunction with the Annual Indian Naming Ceremonies, an Indian Princess Pageant was held which included competition categories such as poise and speaking voice. These women were the predecessors of the Odawa Homecoming Queen. Harbor Springs, MI. As with the pow wow, reintroducing the selection of a princess served to bring back some of the previous generations’ traditions and the traditions attached to the history of the Ottawa Stadium. It also provided a leadership opportunity for young Odawa women who wanted to become more involved in Indian country. Every year the Odawa Homecoming Pow Wow has been held, we have had a “Miss Odawa” chosen based on competitions in public speaking, knowledge of culture and history, overall poise and dance skill. In 2017, we had a “Junior Miss Odawa Nation” chosen based on competitions in public speaking, knowledge of culture and history, overall poise and dance skill. 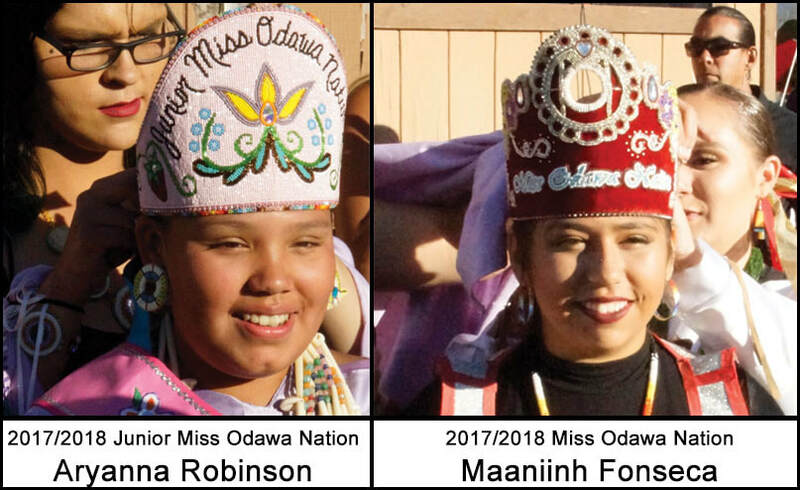 Again this year, we have young ladies who have the desire to give back to their community by becoming Miss Odawa Nation and Junior Miss Odawa Nation. As they compete for the titles, they act as bridges between the past and future.